New York Post Writes … Ryan Lochte Is Everything the World Hates about Americans … Why Does Lying, Entitled, Unethical Hillary Clinton Get a Pass? HMM, I WOULD ASK YOU ALL … WHY IS RYAN LOCHTE HELD TO A HIGHER STANDARD THAN HILLARY CLINTON? Welcome to the double standard of the MSM. As the media tries to make American Olympic swimmer Ryan Lochte, yeah most Americans are saying, who, public enemy number one and the face of the “Ugly American” … the same media gives lying, crooked and corrupt Hillary Clinton a pass. The MSM is all over the story as to whether Lochte and 3 other American swimmers who claimed they were robbed at gun point in Rio during the Olympics are lying or not. Calls to throw them in jail, teach them a lesson have been made. Really? In the infamous words of Hillary Clinton, ‘What difference does it make”? Are you telling me that Lochte and the 3 other swimmers, if true lied, should be held to a higher standard than Hillary Clinton? Lochte did not have a private email server in his bathroom saving top secret US government emails. Lochte did not use his position as a member of the America swim team to garner access to the US State Department and export donations to his own family foundation. I am pretty sure he does not have a slush fund family foundation. But you know who does, Hillary Clinton! Could Liar, Liar, speedo on fire be easily changed to Liar, Liar, Pantsuit on Fire? But the lying, corrupt, in the tank media would rather have you believe that Ryan Lochte is worse than Hillary Clinton. This is the diversion of the media and what they will and will not cover. Hillary Clinton committed a crime and should have been indicted under the espionage act, Lochte is just a fool. The MSM would have you believe that Lochte’s lies and coverup is like Watergate, and Hillary is just a victim of the right wing conspiracy. Get a clue America, wake the hell up! 19 year old US swimmer Katie Ledecky wins the gold medal in the woman’s 400 meter freestyle last night at the Rio Olympics and break her own world record by nearly 2 seconds. Before these Olympics are over, Katie Ledecky will become a house hold name and one of the most decorated American athletes at these games. She is not only willing events, she is destroying the competition. Ledecky took home the gold for Team USA with a stunning time of 3:56.46, two seconds ahead of her own record pace. Fellow American Olympian Leah Smith racked up another medal for Team USA with a Bronze Medal appearance. 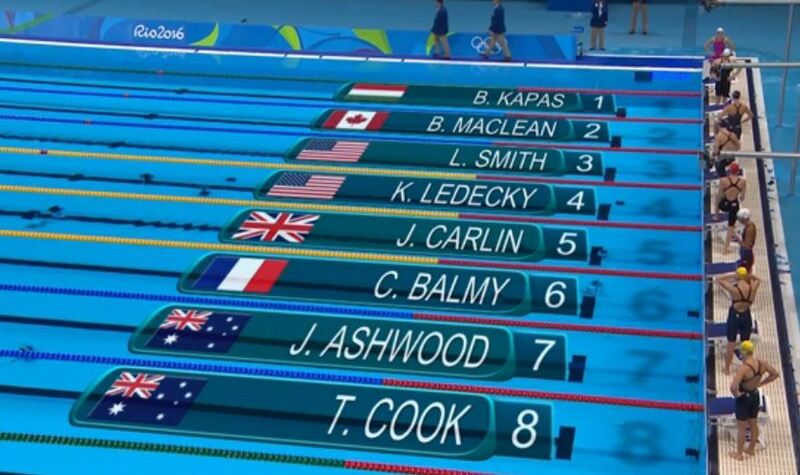 At this point, all that’s left for Katie Ledecky to chase is history. The 19-year-old swimming superstar entered these Olympics as the current world-record holder in the 400, 800 and 1,500 meter freestyles. The challenge when she swims those events here? To beat her past, slower self. On Sunday night, she did just that, knocking nearly two seconds off the world record in the 400 free to secure her first gold medal of these Games. 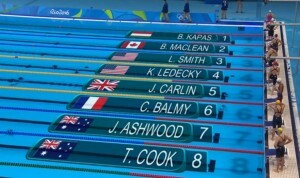 She won in 3:56.46, followed by Britain’s Jazz Carlin and American Leah Smith, who were almost five seconds behind. American shooter Ginny Thrasher from West Virginia won the first gold medal for the United States of America in the 206 Rio Olympics. The West Virginia teen pulled off an upset in the women’s 10-meter air rifle event Saturday morning. Way to go Ginny!! !